A Bear Market Strategy selects safe harbor investments during a market crash. When a market direction indicator (such as StormGuard or the Death Cross) signals conditions have become bearish, a Bear Market Strategy automatically takes charge and selects a trusted safe harbor investment from a list of candidates, such as cash, money market funds, bond funds, gold bullion, and US treasuries. Although numerous market sentiment indicators have been developed over the years to help determine when to flee to safety, none of them come close to the performance provided by StormGuard-Armor. 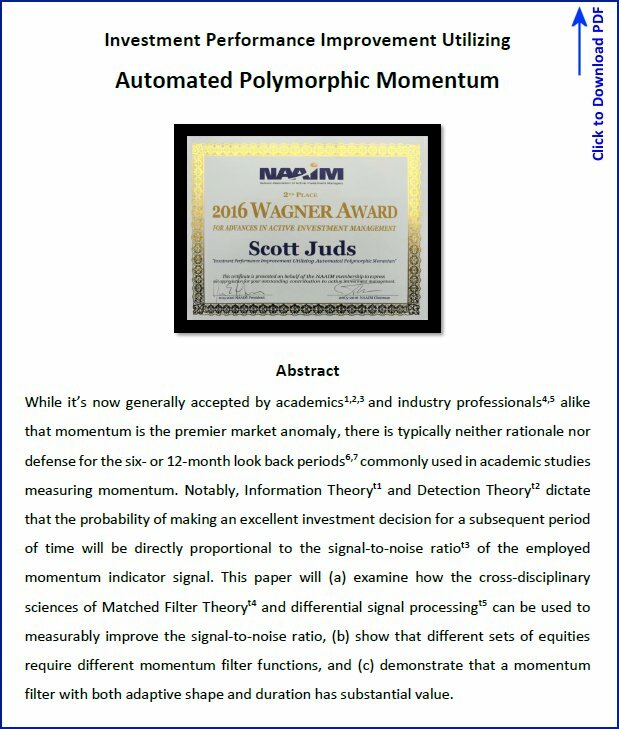 While the theoretical basis for each of them sounds promising, many are only poorly correlated with future market performance. Comparison of some of the better ones is detailed HERE. 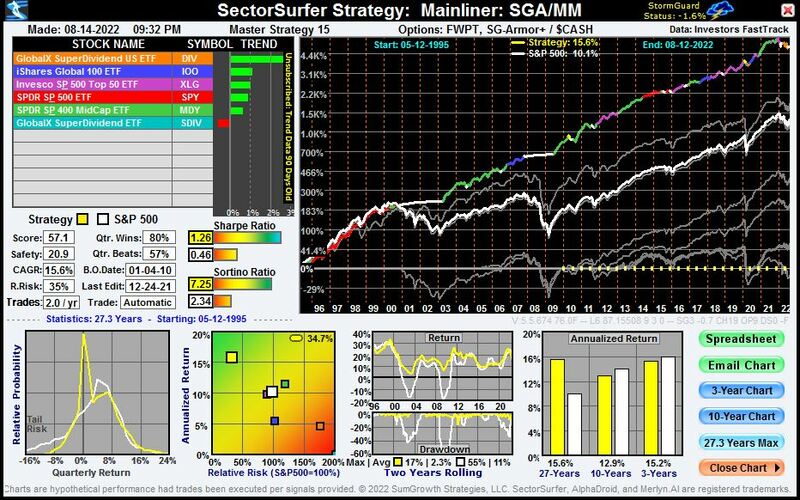 The significant value Bear Market Strategies further add to StormGuard-Armor is illustrated by the remarkable difference between the yellow equity curves in the Strategy charts below. The reason Bear Market Strategies matter so much is illustrated by (a) the yellow equity curves, (b) the compound annual growth rates (CAGR), and (c) the Sharpe Ratios (risk-adjusted return) in each of the above charts. 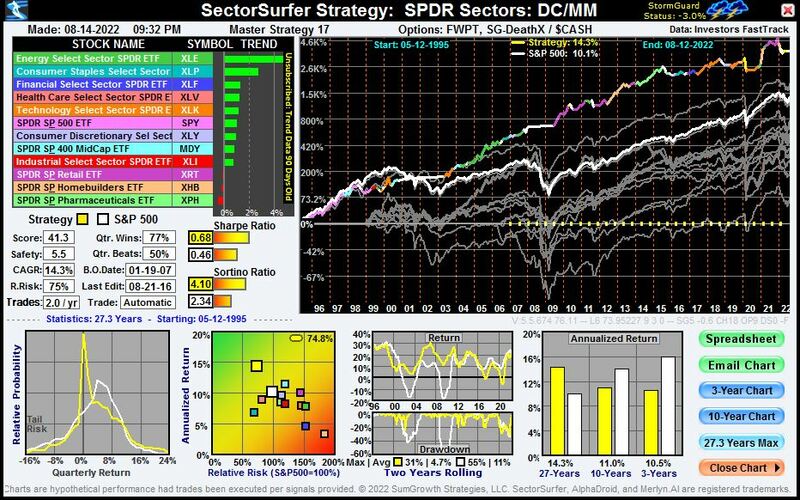 All three investment Strategies rely on SectorSurfer's True Sector Rotation algorithm to determine which one of the eight candidate SPDR sector ETFs to own each month during bull markets. 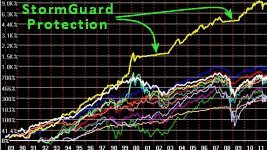 The difference in Strategy performance comes from the addition of StormGuard-Armor and an integrated Bear Market Strategy. 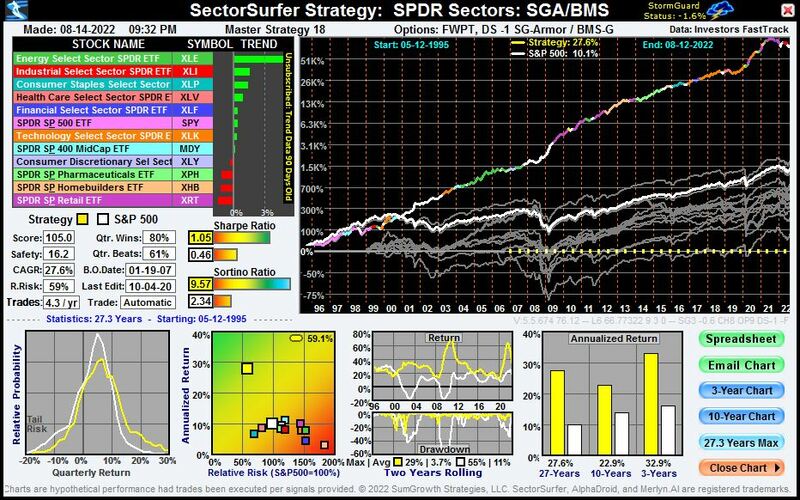 The Strategy on the left has no market crash protection; the Strategy in the center additionally utilizes StormGuard-Armor to determine when to exit the market to the safety of cash; and the right-most Strategy additionally utilizes StormGuard-Armor in combination with Bear Market Strategy BMS-4 to select the best trending ETF during bear markets from among safe harbor candidates UST, TLT, BND, MBG, MUB, CORP, SH, and GLD. Wall Street often refers to this as a risk-on / risk-off investment approach, where risk-on means a move to riskier investments with potentially higher yields during bull markets, and risk-off means a move to safer investments with typically lower yields during bear markets. Long-term U.S. Treasuries have been the best performing asset class during recent bear markets because they have been more negatively correlated with U.S. stocks than anything else for nearly two decades. However, the two have not always been negatively correlated, as is easily appreciated from the Rolling 5-year correlation between U.S. stocks and 5-year Treasury chart (right). What this means is that they could become positively correlated again at some point in the future. Thus, considering only long-term treasuries for a bear market strategy based on their 15-year prior performance would be falling victim to hindsight selection bias, resulting in substantially increased portfolio risk during the next market crash. Bonds: Similarly, bonds have not reliably been a safe haven during bear markets as illustrated by the Correlation between U.S. stocks and 10-yr U.S. bonds chart. Furthermore, bonds are quite diverse. Whereas high yield, emerging market, and municipal bonds experienced mild to moderate losses during recent bear markets, mortgage-backed and aggregate index bonds were remarkably stable. 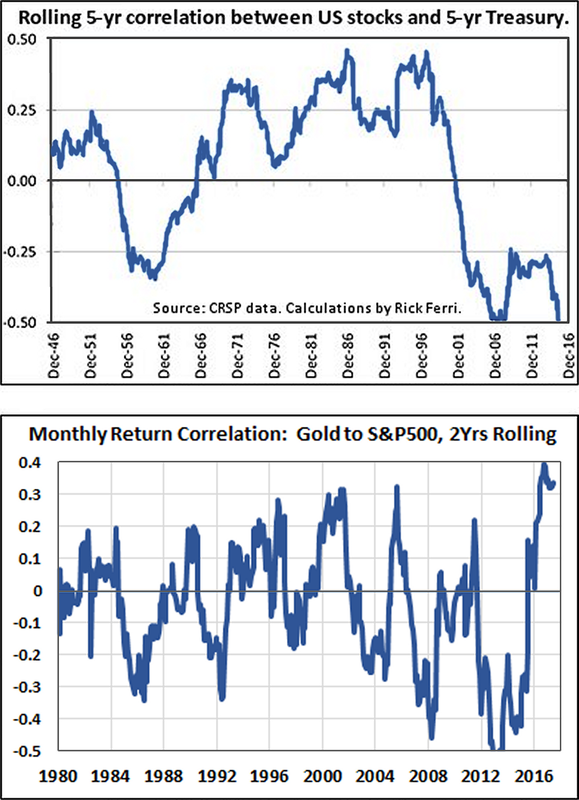 Gold: Although "gold bugs" view the precious metal as an investment that will protect them from market downturns, Gold's Correlation to the Equity Markets over the past 45 years has averaged zero, meaning gold at times has provided protection and at other times has not. So again, not a reliable solution by itself. The Solution? 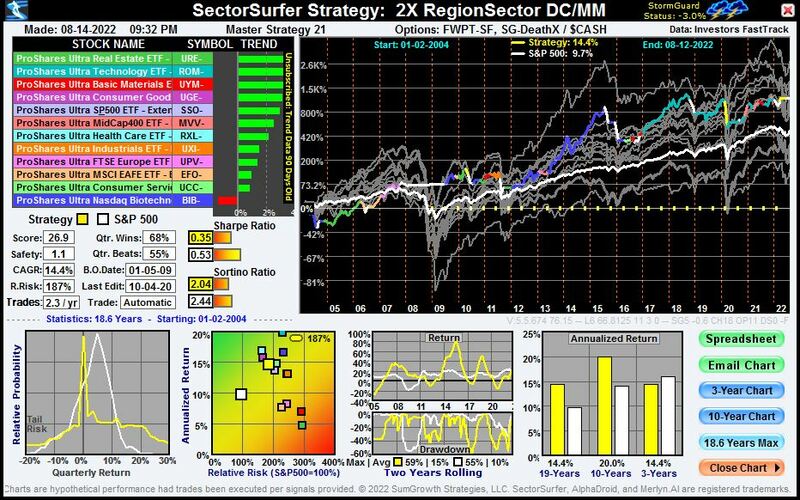 A Bear Market Strategy: While future correlations may be unknown, fortunately the current best-performing bear market candidate can be identified by a Bear Market Strategy utilizing our True Sector Rotation algorithm. In order to reasonably model the performance of a BMS (Bear Market Strategy), its candidate investments must have performance data that spans at least one major market crash. Although most ETFs that might provide safe harbor during a bear market were started only recently, most are based on indexes with much longer histories that can be used to artificially extend the ETF's data for purposes of improved strategy modeling. The table below contains excellent candidates from these asset classes: long-term treasuries, bonds, inverse markets, and gold bullion. Additional documentation and a list of numerous other extended ticker symbols can be found HERE. • Note 1: Extended ticker symbols have a "-" added as a suffix to indicate they are the extended data version. • Note 2: The above list is not an exclusive list of candidate funds for Bear Market Strategies. You may try anything. • Note 3: SHGD- and SHUG- were created as a means to reduce individual ETF volatility and allow them to trade better. The table below details 22 high performance, ready-made Bear Market Strategies that help eliminate hindsight selection bias during bear markets and integrate easily with StormGuard for use with any Strategy. The first seven are ETF-based and are increasingly aggressive in their approach. A few of them are designed to specifically use mutual funds of a particular fund company, and many of the others strive to use different sets of ETFs so that different strategies in your portfolio don't all pick the same funds during a bear market. Any of them can be imported and customized to better suit your objectives. • Note 1: DSD column in the above table refers to the Decision Shift Days advanced option. It is presumed that: (a) BMS-5 and BMS-6 will be primarily associated with some of the narrower sector ETFs and 2x ETFs that generally perform better with a DSD setting of -1, and (b) that BMS-7 will be primarily associated with 3x ETFs that often perform better with a DSD setting of -2. • Note 3: All of the mutual fund Bear Market Strategies include the special ETF based SHGD- ticker symbol. Depending on your brokerage and account type, you may find trading between mutual funds and ETFs problematic because of settling time rules. There are three options for dealing with this problem: (a) import the Bear Market Strategy and edit it to remove SHGD-, (b) wait for the settling time to clear, or (c) change your account or brokerage to one that alleviates this problem. • Note 4: In Jan 2019 two significant upgrades to Bear Market Strategies were implemented across the board: (1) An algorithmic technology developed for Merlyn.AI that we call Pop-n-Drop was integrated into Bear Market Strategies. Funds that have an outsized pop in their price in a short period are more likely to go flat or retract in the subsequent month than continue to the moon. This behavior is seen in treasury funds as well as inverse (short) market funds at the bottom of a crash. Bear Market Strategies are now able to most often take advantage of these special anomalies that are particularly important during bear markets. 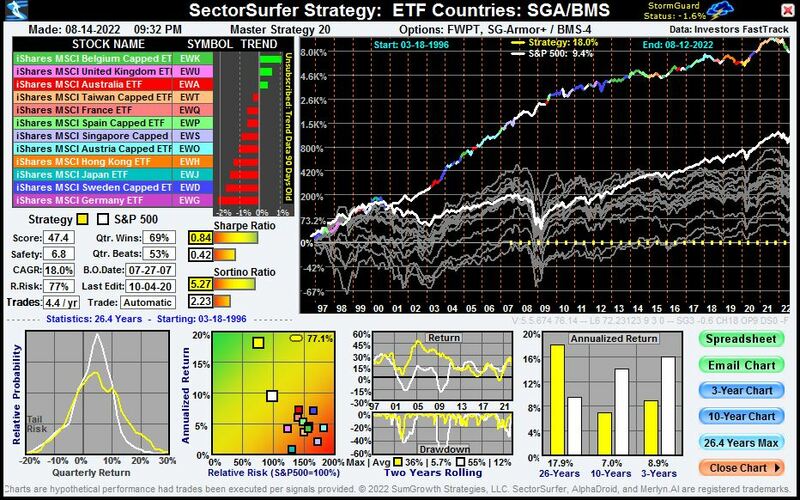 For example, BMS-G and BMS-M now successfully use inverse market ETFs and BMS-5 and BMS-6 now more successfully use leveraged long term treasuries to great advantage. (2) A simple rule was implemented to prevent the Bear Market Strategies from inadvertently selecting Hi-Yield Junk bonds during the first two months after StormGaurd-Armor is triggered. It is well-known that Hi-Yield Junk bonds sink considerably during a market crash. If you don't believe the company's future earnings will be good, then you likely won't trust their ability to pay off their bonds. Unfortunately when markets suddenly turn downward, a Bear Market Strategy that had been holding a Hi-Yield Junk bond may not lose its trend leadership fast enough to quickly get out of the way during the initial downturn like they do when the the market rollover is slower. Implementing this simple rule helps the Bear Market Strategy better adjust to rapidly changing markets. Keep in mind that when upgrades such as these are made to the algorithm, they likely apply instantly to all Strategies that use/integrate them. This can cause affected Strategies to show a different sequence of ownership during prior Bear Market events. This is the proper expectation for investment model upgrades. Strategies are not accounting systems or live operating funds. Strategies are like a business plan as opposed to a quarterly report. If you wish to maintain operating records you can view the actual history of trade alerts by clicking the green H history icon, and occasionally saving a copy of the Strategy chart in a log document is a fairly easy record keeping process. Contrast: The comparative benefit of employing each of the eight different Bear Market Strategies is illustrated in the chart (right). 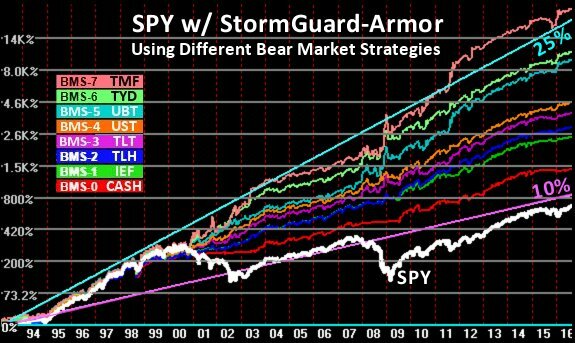 Each plotted Strategy is based on owning the market index SPY during bull markets, but owning one of the eight Bear Market Strategies during bear markets (when directed by StormGuard-Armor). 10% and 25% constant returns lines are also plotted as performance references. 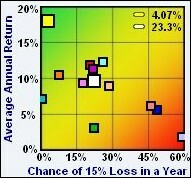 The significant differences in total return, return uniformity, and general volatility are quite notable. A judgment call pitting better returns against the risk of additional volatility is required. Guidance: Selecting a Bear Market Strategy is primarily a matter of judgment involving investment risk tolerance. Since the character of the main Strategy's candidate funds is already a statement of investment risk tolerance, using a Bear Market Strategy of similar character is appropriate. 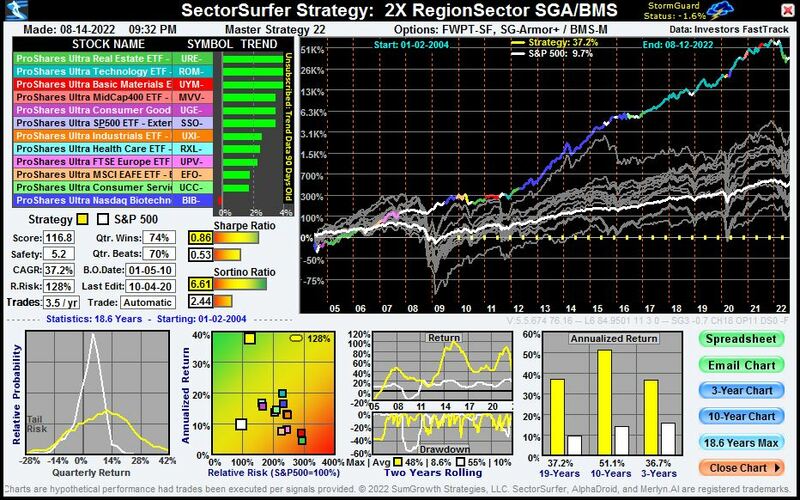 For example: (a) a broad asset class Strategy typical of a 401k plan would be best matched to BMS-2 or BMS-3, (b) a sector rotation strategy would be best matched to BMS-4 or BMS-5, and (c) an aggressive 2x or 3x leveraged fund strategy would be best matched with BMS-6 or BMS-7. The best way to create a custom Bear Market Strategy is to start by importing and editing an existing one. Use the Strategy-ID from the table above in the Select-a-Strategy popup window (click the icon). Reasons for modification might include: (a) BMS-Vanguard may be more suitable for you if the ETF SHGD- were removed, (b) BMS-Fidelity may perform better if it were more aggressive and included UST-, or (c) you may find that other ETFs not considered above may improve performance even better. In order to use your custom BMS in another Strategy, you must identify it using the special ticker symbol format of SSSnn, meaning SectorSurfer Strategy #nn (where nn has no leading zero). For example, if your BMS is Strategy #24, then use SSS24 as the special ticker symbol when specifying it in the Advanced StormGuard Options Bear Symbol field of any Strategy for which SSS24 is to act as the Bear Market Strategy. • Tip 1: Since Strategies are evaluated each evening in the sequential order of their Strategy numbers, make sure the Strategy number of each BMS is lower than the number of any Strategy that uses it so its results will be current. 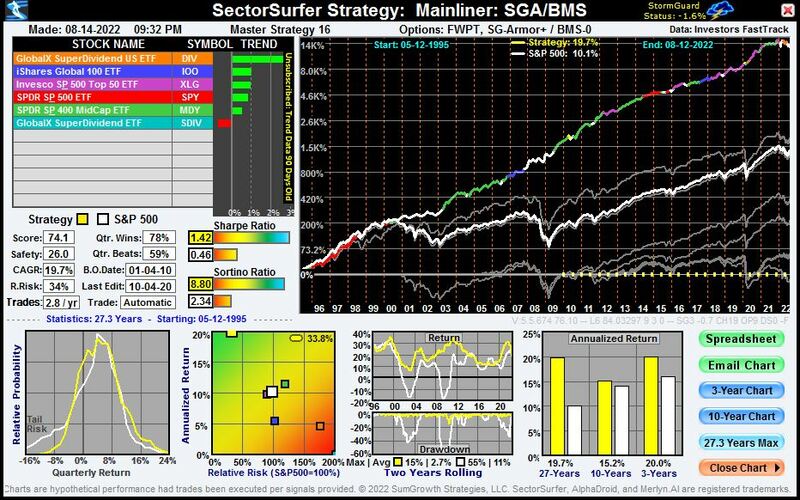 • Tip 2: The Bear-R and Bear-SD values (annualized return and standard deviation produced during periods when StormGuard-Armor is triggered) are reported in the BMS chart subtitle (when its name starts with "BMS-" and StormGuard is disabled) to help simplify BMS development. StormGuard options are located on the Strategy Information popup window, which is accessed by clicking the icon next to the Strategy's name on the Strategies Management page. Click the button to expose them and make your selection from among the StormGuard Options shown. In addition to the six StormGuard methods for detecting the onset of a bear market, the Bear Symbol provides a method for determining which investment should be held during bear markets by specifying its ticker symbol. Although $CASH (a generic symbol used to mean "your favorite money market fund") is the default symbol, you may use any other ticker symbol of your choice, including those for; (a) ETFs and mutual funds, (b) extended history symbols, (c) ready-made Bear Market Strategies (listed above), or (d) the special ticker symbol for referencing one of your own Strategies using the format of SSSnn, for SectorSurfer Strategy #nn (where nn has no leading zero). Below are a set of Strategy pairs that reveal the stark contrast between the following: (a) the well-known and respected Death Cross a algorithm to determine when to move to the safety of a money market fund, versus (b) the better performing StormGuard-Armor algorithm, which determines when to switch to a Bear Market Strategy. In the charts below, the Strategy equity curve is multi-colored to show which of the candidate funds was owned at any particular time. The equity curve is white when the Death Cross or StormGuard algorithms have triggered and have commandeered the investment decision. Selecting the trend leader from among the broadest of market index ETFs. Death Cross triggers exit to money market fund. 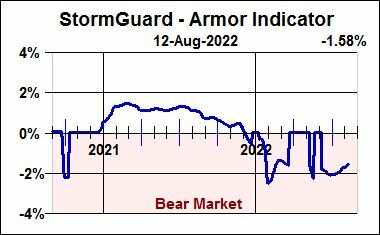 StormGuard-Armor triggers Bear Market Strategy. 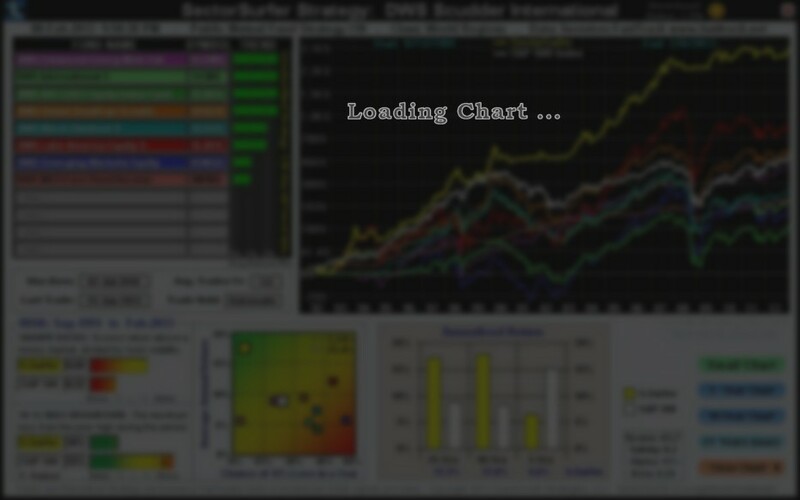 Selecting the trend leader from among SPDR sector ETFs. Selecting the trend leader from among iShares country ETFs. 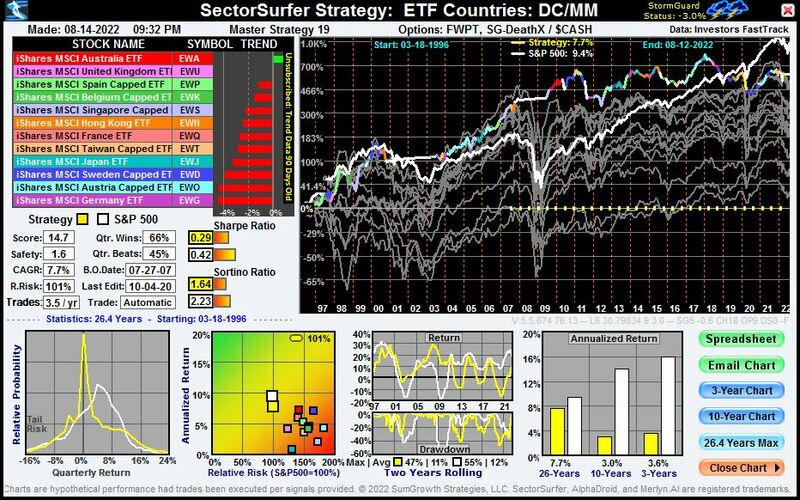 Selecting the trend leader from among 2X leveraged world region and sector ETFs.